Kamikaze is the tenth studio album by American rapper Eminem. 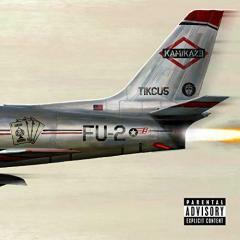 Previously unannounced, the album was released on August 31, 2018 by Aftermath Entertainment, Interscope Records, and Shady Records. The album features guest appearances from Joyner Lucas, Royce da 5'9", Jessie Reyez, and uncredited vocals by Justin Vernon. Eminem, credited as Slim Shady, and Dr. Dre served as executive producers, while production for individual tracks comes from a variety of musicians. The album was met with positive reviews from critics, but generated some controversy for use of a homophobic slur and several diss tracks. The album topped the charts in many places of the world, including Australia, Austria, Canada, Denmark, Finland, France, Ireland, Italy, the Netherlands, New Zealand, Norway, Sweden, Switzerland, the United Kingdom, and the United States.